Another niche mattress? We’re sure you’ve never seen ones like these before. The Spartan by Brooklyn Bedding was designed for ideal rest and recovery. If you’re an athlete, have recently had an injury, or are dealing with the symptoms of a past injury, the Spartan has properties that specifically focus on recovery. Similarly, the Bear Hybrid mattress was engineered for performance and long lasting durability, just like you. These mattresses are thick, thicker than most on the market, giving you great pressure relief and ideal support. Continue reading our in depth review of the Spartan vs Bear Hybrid mattresses. Hopefully it will make your online shopping experience that much easier! The Spartan mattress is built like an athlete, for an athlete. The mattress incorporates the latest technology with its Nanobionic RE-3 performance cover. The fibers in the cover are proven to increase oxygenation and circulation. The Spartan also includes the natural healing benefits of Copper, sewn right into the top layer of foam, to help the body repair. In total, the Spartan has 5 layers, making it 13.5” thick, with a dreamy surface that leaves you refueled for the next day. Overall the mattress has contouring pressure relief and responsive adaptability to move with you, just as fast as you are. 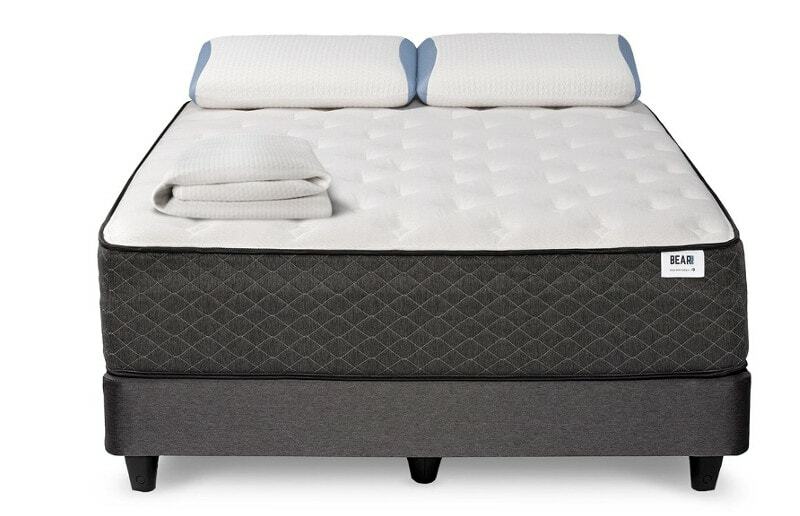 Combine all that with a durable coil system and dense base foam, and you have the ultimate mattress for recover, but also comfort and contour as well. 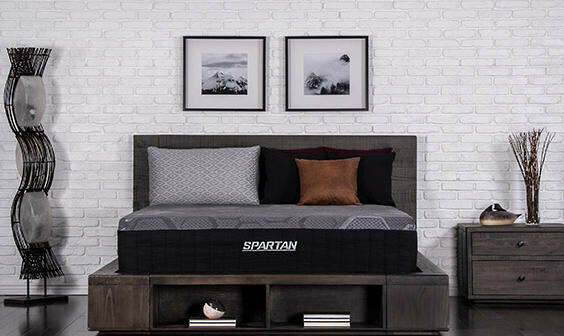 The best part is, the Spartan comes in three comfort options; soft, medium, and firm, so you know you’re getting a mattress that rejuvenates your body and optimizes your unique performance. Check out the full review of the Spartan Mattress HERE and shop this warrior made bed HERE! The Bear Hybrid mattress is balanced, comfortable, and supportive, unlike any other typical market mattress. The Bear Hybrid uses impressive Celliant technology to aid the body in recovery. What you get is a luxurious mattress that uses a pocketed coil system and unique, high-quality foams fit for any sleeper. This mattress is a whopping 14.5” with an ideal medium feel. It’s foam layers are thicker than most, creating responsiveness and contour, as well as ideal pressure relief. All of this sits atop a Pocketed coil system with 1300+ individually wrapped coils and a dense base foam. Finally, wrap this mattress up in a hand-tufted cover that works for your body everyday, and you have a handcrafted mattress that is unbeatable in quality and comfort. 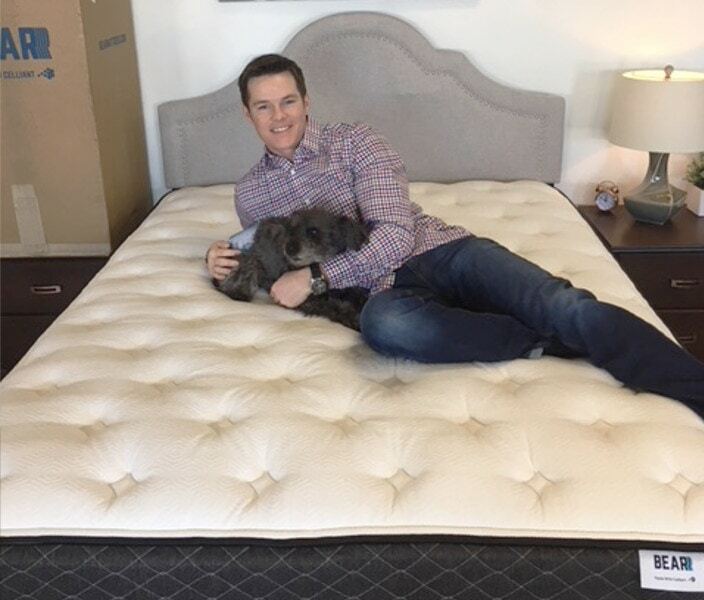 Forget less is more, with the Bear mattress more is more, and this mattress gives you everything. Check out the full review of the Bear Hybrid HERE and shop this ideal feeling bed HERE! Bear Hybrid Coupon: Save BIG With The Latest Coupon HERE! When shopping online, it doesn’t get any easier than the delivery and unboxing process. After you order your new Spartan mattress, in just a few short days it will arrive at your door, compressed and rolled into a convenient sized box. Keep in mind, that as convenient as the box may be, it still holds a lot of mattress and is still heavy, so having a dolly or an extra set of hands is helpful. Once your mattress is in its final destination, the bedroom, simply remove it from the box and position it on its foundation. Then carefully cut away the plastic and don’t look away, or you’ll miss the very quick initial expansion. It will amaze you how the Spartan can grow to its full thickness within a matter of minutes. At the same time, while it will be thick and ready for sleeping, the mattress takes a few days to fully firm up, so don’t judge the comfort too quickly. The Spartan is made in the USA with 100% USA made materials, so you know there won’t be anything harmful or toxic. You may notice a few typical “new mattress” smells, but the off-gassing will be minimal. We always recommend opening a window to speed up the off-gassing process and waiting a few hours before putting your bedding on. 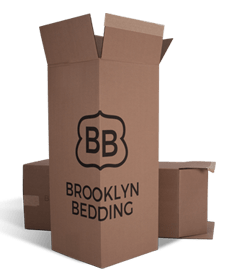 Ready to order your new Brooklyn Bedding Spartan mattress? Easily order yours now at BrooklynBedding.com. 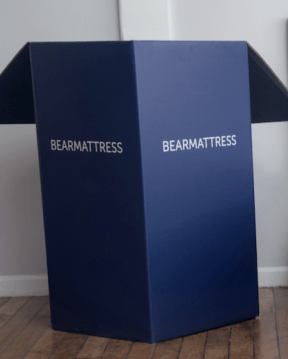 For so much mattress, you’ll be surprised they can fit it into that box, but after ordering, your Bear Hybrid mattress will arrive conveniently at your door ready for setup. 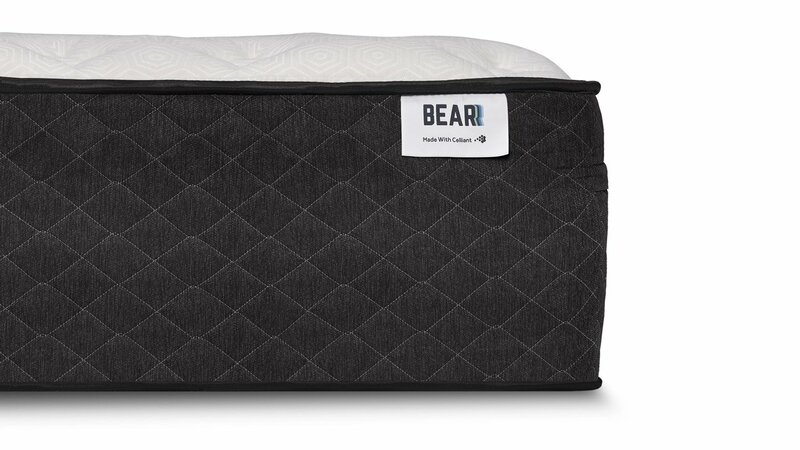 The Bear Hybrid mattress box will be heavier than most, weighing approximately 110 lbs., so you definitely want an extra set of hands to help you maneuver it. This just means the heavier the mattress, the more substantial the materials are, and that’s a win for you (and your sleep). Like other boxed mattresses, simply place the Bear on its foundation, remove the box and plastic, and sit back as your mattress expands like magic. The Bear Hybrid mattress will be ready for your sleep immediately, but you will want to wait a few days while the foams truly firm up, before you judge how comfortable it is. Every mattress has a “new smell”, but with the Bear Hybrid, off-gassing will be minimal. Plus, the USA made mattress uses USA made materials, which tremendously cuts down on any noxious or harmful odors. If you are sensitive to smells or just want to lay on your mattress already, opening a window helps speed up the off-gassing process. In the meantime, you’ll want to wait a few hours before putting on your Bedding too. This will prevent your bedding from trapping any of the odors. Think that the thick Bear is for you? Order your new Bear Hybrid mattress at BearMattress.com. The special thing with both of these beds is the technology incorporated to help with recovery. Not only do both beds use materials to help your body get great rest. But, both also incorporate some of the latest and greatest technology to really allow your body to recover and rejuvenate night after night. 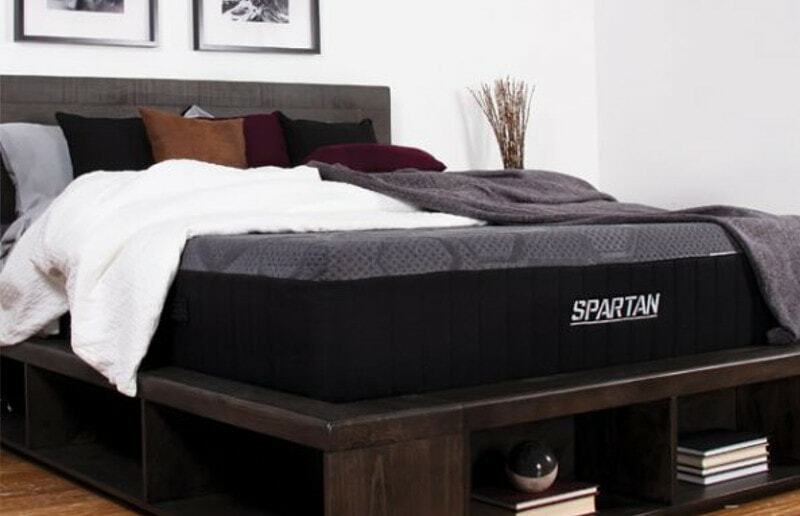 Brooklyn Bedding knows how to create a well made mattress, and the Spartan is no exception. This mattress is made for the daily warrior. Infusing an advanced FDA approved, Nanobionic RE-3 cover. This cover takes your body’s natural heat, turns it into waves of energy, and then reflects it back towards your body. This technology is clinically proven to increase oxygenation and circulation for improved quality in sleep, health, and overall wellness. All that, and it’s still super soft to the touch for ultimate comfort. The Bear Hybrid uses a similar technology in their cover too. It is a hand quilted Celliant fiber top. Carefully woven with Celliant’s Infrared Yarn Technology that harnesses your body’s natural energy to promote recovery and overall well-being. When it comes to which is better you could argue that the Celliant infused Bear cover has been tried and true over the last several years. Making it potentially more compelling. But you could also say that the Spartan may dominate with the most up to date innovation offered to replenish the body during sleep. Regardless of which one you choose, you and your body are sure to benefit from both of these covers. Besides the amazing cover, the Spartan is 13.5″ and includes 5 layers of support and comfort. The first comfort layer is 1.5” of thick Copper Gel Energex foam infused with TitanCool phase changing molecules. This foam is contouring and provides ideal pressure relief. The Copper also gives the mattress added benefits including clean, cool, and potentially helps aid your body’s recovery process. And the added TitanCool keeps a more even temperature; and all that is just the top layer. Next is 2” of Hyper Elastic TitanFlex foam. This patented foam provides immediate response giving you plenty of deep support and comfort that adapts and moves with your body. This layer is meant for easy moving and all you sleepers who love to change sleeping positions. The final comfort layer is 1” of Swirl Visco-Elastic Memory Foam. This layer also provides deep support and comfort, ideal for heavier sleepers and side sleepers. The foam creates deeper compression for alleviating pressure, and is also enhanced to keep the foam cooler. These three foams together create ideal comfort and support, to help your body rest and recover. Next are the support layers. The bulk of the Spartan support comes from the foundation- an 8” Quantum Edge Coil System. This support layer is still highly flexible and moves with the body, while providing longevity and durability with each steel coil. This creates proper spinal alignment, ergonomics, and further pressure relief so that you get a restful sleep night after night. The final layer is made of 1” High Density Base Foam. This layer is the key to stability; keeping everything consistent while the coils rest on it. It is also built with outstanding durability and longevity to make sure you and the mattress always perform optimally. The Bear mattress has 5 unique layers under the cover. Giving you 14.5” of one of a kind comfort. From top to bottom, the first layer is a Hypersoft Cooling-gel foam right under the Celliant woven cover. This layer add a soft and plush feeling immediately on the surface. Nest is a premium comfort foam layer that adapts to all body’s types and sleeping positions. This layer cradles your body so you can rest undisturbed. Beneath that is a layer of responsive transition foam. This layer offers airflow and pressure relief. Next is the Quantum Edge Coil System. For the mattress it provides superior edge support alignment, but for the sleeper it provides superior lumbar support, optimal spinal alignment, and unparalleled pressure relief. Finally, all of that sits atop a high density bandages e foam. This layer is crucial for ensuring that all layers stay in place, and is necessary for the long lasting durability of the mattress. You’ll be happy that the Bear mattress is a big purchase that provides even bigger results in durability. You don’t have to be a universal athlete to be successful, and you don’t have to settle for a universally comfortable bed. With niche mattresses like these, you often have to sacrifice comfort, but not with the Spartan. The Spartan offers three mattress variations: soft, medium, and firm. This not only ensures that your body isrecovering, but also has individualized comfort for your best sleep yet. When shopping for comfort it is important to consider the sleeping position you use most and your size. The soft Spartan is ideal for mainly side sleepers or back sleepers who like a little extra plush. This comfort option is also great if you have a small frame and like a plusher feel. The soft Spartan is not meant for stomach sleepers because it makes the mattress too soft, potentially causing your back to bow. The medium option is of course, the most popular. It works for almost any sleeper or sleeping position. You can sleep on your side, back, or stomach and still have great support and pressure relief. This comfort option is ideal for couples or sleepers who like to sleep in various positions throughout the night. Finally, the firm option is going to be ideal for back and stomach sleepers. Or anyone who prefers little to no sink in their mattress. This option will also work well for heavier persons, giving them a more medium-firm feel. You should not choose the firm option if you are a side sleeper or smaller framed, unless you like a really firm feel. Choose your ideal firmness and start recovering while you sleep with the Spartan Mattress at BrooklynBedding.com! The 14.5” Bear hybrid mattress combines several performance foams with a micro coil system. With the Bear you get an ideally balanced mattress that provides great flexible support. The base is firm, but the coils give it just enough responsiveness to make it easy to move on and dissipate heat. The comfort foams are the perfect combination of pressure relieving memory foam and adaptable Bear foam. The Bear’s universal comfort level scores about a 5.5 to 6 on a 1- 10 scale. This is the ideal medium-firm mattress, just a touch on the firmer side, that you want, making it ideal for every sleeping position. For side sleepers, the Bear Hybrid bed is just soft enough to hug the shoulders while the hips sink in. For stomach sleepers, the Bear Hybrid is firm enough so that your back never bows. And finally for back sleepers, the Bear has the perfect “sweet spot” for comfort and support. Looking for that perfect “sweet spot” when it comes to the comfort of your mattress? Get the Bear Hybrid today at BearMattress.com! The Spartan uses the perfect combination of materials to combat motion transfer. Anytime you have dense foams at the top of the mattress, these foams are going to absorb most of any movements by isolating motion. The dense foams also creates a barrier between you and the coil system. So any motion that occurs is absorbed before it can reach the coils. When you think of coils, of course you’re going to imagine a little natural spring. But since the coils are individually wrapped in fabric, they will absorb what little movement remains. With the Spartan, that motion isn’t going anywhere. The Bear Hybird mattress also takes motion transfer seriously. While most hybrid mattresses are created with a dense foundation made of coils, the Bear uses a smaller coil system paired with a thick foam to truly isolate motion. The benefits of the coil system are the same, but being sandwiched between two foams makes it difficult to go anywhere. The Bear is perfect for couples who finally want more sleep, and for lighter sleepers. The Spartan mattress may be top of the line in recovery, but it also ensures that heat never gets trapped while you sleep. The Copper infused in the top layer has natural health benefits. One is that it pulls heat away from your body, helping the foam disperse the heat once it is used. The Titancool infused layers also allow heat to dissipate deep within the mattress. Another important feature is the TitanFlex foam, which allows you to move easily and never feel stuck. This is important because stuck means hot. So if you’re never stuck, you’re never hot. Finally, if heat ever does reach the coil system, you know it is guaranteed to escape though the spaces in between each coil. The Bear Hybrid mattress also uses several features to maintain a neutral sleeping surface all night long. First and foremost is the coil system. Like any hybrid, the coils, even micro coils allow a place for heat to escape through. Unlike most foams, the top layer of performance foam generates excellent airflow. It is also dense enough to prevent you from sinking in too much. Like we mentioned with the Spartan, if you’re stuck, you’re hot. Finally, the Bear Hybrid foams are infused with gel which is a huge component to keeping warm to a minimum. With mattresses as thick as the Spartan vs Bear Hybrid, there’s nothing to worry about not using the entire sleeping surface. The Spartan uses enhanced Quantum coils to create stability and consistency. Pair this with dense and durable foams and you get the perfect edge support. This means you can sleep right up to the edge and even occasionally sit on the edge of your mattress. The Bear Hybrid mattress uses ample layers of comfort foams, that not only make a thick mattress, but a solid one as well. You can sleep right up to the edge and never feel a lack of support, making the Bear hybrid a great choice for edge support. When it comes to your rest and recovery, night after night, is there really a price limit? While we know the answer is no, the Spartan and Bear Hybrid provide the ultimate rest and recovery without breaking the bank. The Spartan by Brooklyn Bedding comes to you at $1999 for a queen, however if you act now, our 20% coupon makes it only $1599. 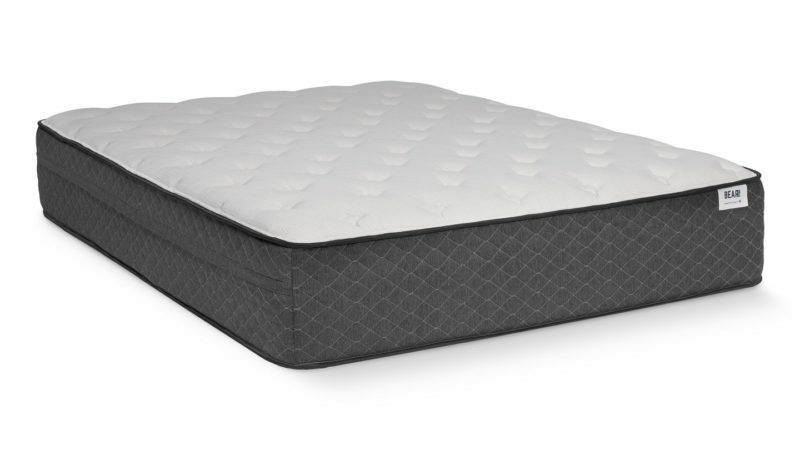 This also includes a 120 night sleep trial, 10 year warranty, free shipping, and free returns. The Bear Hybrid does have a slightly lower price point at only $1350 for a queen, and a current coupon making it $1150. This includes 100 night sleep trial and 20 year warranty. However, let’s not forget that the Spartan has 3 comfort options, making it truly unbeatable, but you still get nigh quality mattresses with both choices. The Spartan mattress has a lower warranty, but longer trial period. While the Bear Hybrid mattress has a longer warranty and shorter trial period. Thus, you’re really comparing apples to apples here and the Spartan and Bear are evenly matched. No matter which option you choose you know you’re buying from trusted brands that support their customers and their products. You can never have too much of a great thing. That’s why the decision between the Spartan vs Bear Hybrid should be easy, you can’t go wrong. If you like having the option of personalization, the Spartan is the way to go. If you like a longer warranty and lower price point, the Bear Hybrid won’t disappoint. No matter what, if you feel like your sleep is lacking rest, you should recover with the Spartan or Bear Hybrid mattress. Still unsure? 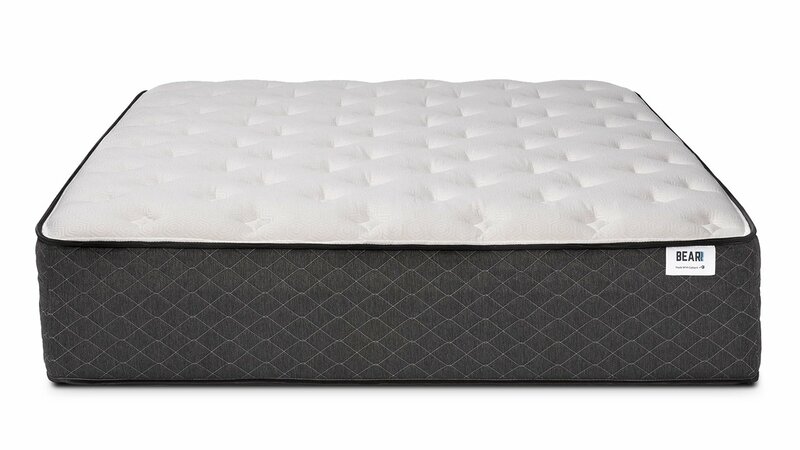 Check out the FULL review of the Spartan by Brooklyn Bedding HERE and the Bear Hybrid Mattress HERE! For more comparisons reviews beyond the Spartan vs Bear Hybrid mattresses make sure you check out our Mattress Comparison Page. This will give you access to all our comparison reviews. Including some of our most popular including the Puffy vs Purple, Casper vs Tuft & Needle, Brooklyn Aurora vs Brooklyn Signature and Puffy vs Puffy Lux.